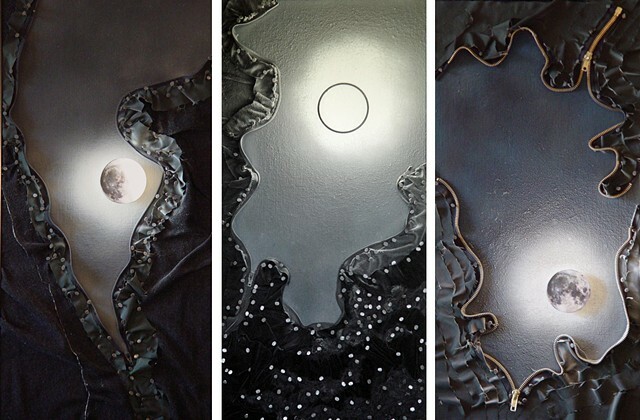 Mixed Media: fabric, tacks, zipper, spray paint, metal and plastic lids, wool roving, bracelet, moon image from NASA on canvas panels. The “Nocturne Series” explores images of the darkened sky as seen by the naked eye and as revealed by the unconscious mind at night in dreams: sometimes the sweetly poetic and sometimes the omnia noctis (omens of the night). I explore the sensuous texture of clouds and sky, the palpable quality of the blackness, and stars as small white orbs, pinpoints of light. Sometimes there is the gentle parting of the clouds which reveals the moon’s soft glow that whitens the sky as it illuminates and caresses the night clouds. Sometimes the sky is dense and black with the moon hidden by clouds and then the moon emerges and shatters the blackness as it tears and tatters the fabric of night.